Stephan Weiler holds the William E. Morgan Endowed Chair as Professor of Economics at Colorado State University. He received his BA (Honors) in Economics and MA in Development Economics from Stanford University in 1988, and his Economics PhD from UC-Berkeley in 1994 where he studied with eventual 2001 Nobel Laureate George Akerlof. From 2004 through 2006, Stephan was appointed as Assistant Vice President and Economist at the Federal Reserve’s Center for the Study of Rural America to lead the Center’s applied research work. The Center was the focal point in the Federal Reserve System for rural and regional development issues, providing cutting-edge research perspectives to private, public, and nonprofit decision makers. Stephan became a frequent speaker before industry, university, and public policy audiences throughout the nation, is a regular contributor to media outlets ranging from the Wall Street Journal to National Public Radio, and has published over one hundred articles, book chapters, and policy papers. He served as Research Associate Dean for CSU’s College of Liberal Arts from 2006 to 2016. His research, teaching and mentoring have spanned a variety of development and labor market issues in Africa, Appalachia, Europe, and the American West. 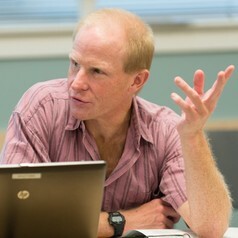 His current work focuses on regional economic growth and development, particularly in rural and inner-city areas, combining theoretical, empirical, and policy analyses on topics such as information, innovation, industrial restructuring, land use, public/private partnerships, immigration, entrepreneurship, and the environment. These various elements informed his role as founding research director of the Colorado Innovation Report (www.innovation.colostate.edu), begun in 2012 with a broad-based coalition of leaders from the private, public, and nonprofit sectors to understand and enhance the state’s innovative capacities. He is distilling these three decades of experience into the Regional Economic Development Institute (REDI@CSU), partnering with the City-Region Economic Development Institute (City-REDI) at the Birmingham Business School in the UK to provide fresh, timely, and cutting-edge information to enhance economic growth and development prospects for regions across the globe.